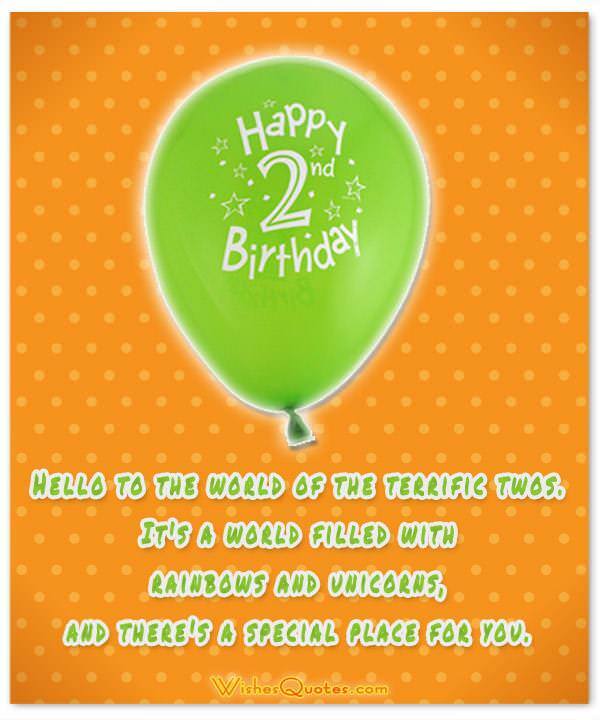 Birthday greetings for a two-year old may seem odd because your favorite little person will most likely skip the message and proceed to chewing up the card. However, this baby will be reading and writing in no time, and these artifacts of past birthdays will be treasured mementos of good times gone by. The second birthday is a time for celebration as babies notch more developmental milestones. It’s a time for discovery as babies begin to show their personality. It’s a time for good cheer as babies begin to react to the world around them. At two, babies are fun to watch and even more fun to play with. Strive to be inspirational, witty, lighthearted and sincere. We’ve put together this selection of greetings to make it easier for you to find the right one. Wishing you a life filled with discovery and pure joy. Here’s to big dreams and even bigger accomplishments. Hello to the world of the terrific twos. It’s a world filled with rainbows and unicorns, and there’s a special place for you. Happy birthday to someone truly special. You have brought so much joy to the world. I can’t believe you’re two. It’s been a lot of fun just watching you. Happy birthday my little boo. A happy and joyful life to you, little birthday boy. May you live to see a 102. Two years ago, we looked at you with wonder as you made your grand entrance. Today, we watch you with awe. You are a gift to this world. Happy birthday. You are the future. It’s looking pretty bright right now with you on our side. Happy birthday, little one. I have no super powers to pass on to you, but you won’t need any. You’re looking pretty chill all on your own, birthday babe. Thank you for two years of joy, laughter and tears. May you have more birthdays to come. Life is a journey, and yours is just beginning. It won’t always be fun and games, but you’ll sail through like a champ. Happy birthday, dear one. Cool kids deserve cool birthdays. Here’s wishing that you get all the cool stuff fit for a two-year old. You look into my soul with your bright innocent eyes, giving me joy and hope. May your special day be as special as you are. You are a gift. We are grateful that you came into our lives. Happy birthday, little one. You brought joy and laughter to this world. We wish you happiness and a life of fulfillment. Cake and ice cream. Balloons and confetti. Clowns and ponies. May all your dreams come true today and for many years to come. Happy birthday to our little shining star. The world is so much brighter with you around. Today, you are the picture of innocence. Tomorrow, you will rule the world. Happy birthday, sweetie. You are the coolest kid in the known universe. Happy second birthday. Happy birthday, little rock star. From: Your number one fan. May your birthday be as much fun as you are. You’ll always be s shining star. They’ll bring you toys and lots of fun for girls and boys. They’ll sing and play while you sleep away. Of course, you can because it’s your birthday. Sending you hugs and kisses on this special day. May all your days be filled with joy. Today has been declared “National Cake and Ice Cream Day.” Must be because it’s your birthday. Hurrah, hurrah! At two, you’re all sweetness and light. You have us drooling over your every move, you sweet birthday girl/boy. You’re two, so let me explain how birthdays work. You act cute, and we bring you presents. You act cute some more, and you get cake and ice cream. See, that’s all there is to it. Enjoy your birthday. Happy birthday, twinkle toes. You’ll always be number one in my fickle heart. Two is a fun age. You can make a mess, and no one minds. Go ahead, make the biggest mess you can make today. It’s your birthday. Here’s a life tip: Never lose that sweet smile. Happy birthday, smiley face. Today, they’ll ask you to blow out more candles than you can count. Happy second birthday! Love, happiness and good fortune: may you have all of these in abundance on your birthday and for the rest of your life.